When you’re looking for police gear storage for weapons, evidence or other law enforcement materials, you can’t afford to scrimp on organization or security. Perhaps more than any other type of storage, law enforcement storage structures require incredibly high levels of durability, efficiency, and security. At BSC, we’ve serviced law enforcement professionals with top quality solutions for over 40 years. Our solutions are equipped with specialty electronic devices for fire, emergency, tracking, and information management. Having smart storage not only cuts down labor costs but offers optimal accessibility for users. We build per specification and use only the most durable and quality materials, and we offer specialized solutions that can double the storage capacity of your existing space. When you’re on an emergency call, working on a critical case, or heading out for a long shift, the last thing you need to worry is weapons and evidence storage. We design storage lockers for, military, local police officers, sheriff departments, state troopers, federal law enforcement, FBI, DEA, and many other types of law enforcement officials. Our products are created for specialized uses such as storing high-end computer equipment, weapons, high-tech protective gear, and more. You name it, and we can find your ideal storage solution. If you’re using lockers to store evidence, equipment or even specialized gear, you’ll need the best in security and accessibility, including intelligent security features like RFID. We can customize the design of our lockers to address various needs, such as multiple-level shelving, extra compartments, hooks and bins positioned just the way your team needs them. Our evidence storage solutions help you transfer materials from an unsecured area to the evidence storage room using a secure pass thru locker system. Our evidence lockers can be set up in various ways and with different sized compartments; we also provide refrigerated evidence lockers to ensure the storage and preservation of biological evidence as well as materials for scientific research. Storage lockers and doorways are also outfitted with special latching systems that monitor access to the evidence. 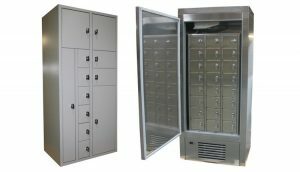 Our lockers are made of welded steel and work well for various purposes. Police tactical gear storage lockers can have multiple doors or single doors, and they can be custom made for police force needs or other first responder’s requirements. We can also outfit our storage units with clothes and gear storage for a range of industries. We guarantee security and durability. For law enforcement professionals seeking options for temporary holding cells, dangerous weapons, tools, evidence, or sensitive equipment, we can provide a range of customized setups to meet your unique needs. Not only that, but our high-grade materials ensure maximum security whether you’re in the office or on assignment. Our wired partitions and temporary storage cages are made with a polyester powder-coat finish and magnetic locks for long-term durability. Our partitions and enclosures can also come with electronic strikes for maximum security. We can also create areas to be used as temporary holding cells, which include tamper-proof hardware and wired ceilings where necessary. When it comes to weapon storage, law enforcement professionals require highly secure and stable areas to keep weapons stable while allowing them to be accessible. Anyone heading out into the field on a moment’s notice or even participating in a time-sensitive drill needs to be able to reach their gear quickly and efficiently. For military personnel, police officers, and others who may store weapons, we can provide gun safes and TA-50 lockers made from high-quality steel that’s built to last and endures through heavy use. 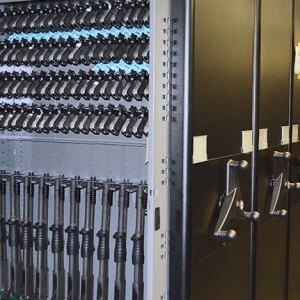 Weapons storage solutions for any type of gear including rifles, shotguns, or even personal defense weapons must be stored in a particular position to ensure security. They must also be in a restricted use and fully secure area. Our solutions will fit your security needs; we even offer secure full steel doors and other customizable solutions. At BSC, we aim to make your job of protecting the public as easy as possible from the ground up. This starts with intelligent design and maximum security for your most important equipment and property, including valuable evidence. Our experienced staff members consult with you to find the exact design and material that works with your needs. We also make our models easy to relocate, while retaining their durability and versatility. Business Systems and Consultants Inc. (BSC) is a leader in quality industrial storage, material handling, and modular office solutions. You can expect the best when it comes to durability, flexibility, and quality. Our experts will help you find the perfect industrial storage solutions for your needs. Want to learn more? Contact us today for more information.